Are you short of storage space in your kitchen? This elegant and practical food storage pantry is the perfect fit for your needs. The storage spaces make it ideal for putting away food as well as kitchen accessories. And you have 4 doors for greater functionality and easier access to contents. Plastic handles in a Glossy Black finish. 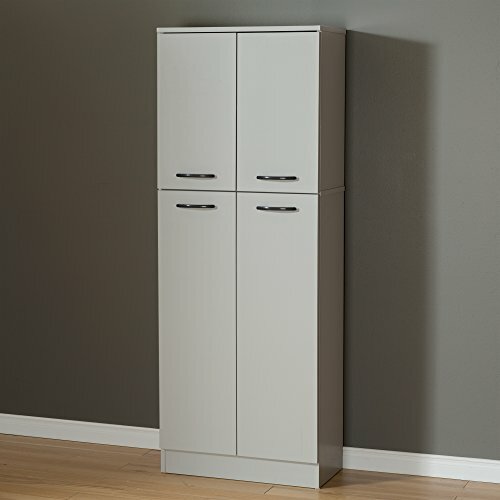 Designed to maximize storage in all the rooms of your home. Closed storage spaces, perfect for food and kitchen accessories. Small upper doors conceal 2 storage spaces separated by an adjustable shelf. Large lower doors conceal 3 storage spaces separated by 2 adjustable shelves. Each shelf can support a weight up to 25 lb. 4 doors, for easier access. Shelf #1 dimensions: 23.5'' (L) x 11.5'' (D). Accessories not included. Requires complete assembly by 2 adults (tools not included). 23.5'' (W) x 11'' (D) x 61.9'' (H). Box dimensions: 46'' (L) x 24'' (W) x 4.5'' (H), 71 lb. Packaging tested and certified to reduce the risk of damage during shipment. Made in North America with non-toxic laminated particleboard. 5-year quality guarantee. Any questions? Contact South Shore, the manufacturer, available 7/7 by phone, email or chat.